I was collected at the crossroads by Thomas in his new red car and drove in superb comfort to Glenluce where we picked up Claire. We met the other walkers at the car park in Creetown and it was good to be joined by new walkers, Eile, Anne and Sandra, all from the Machars area, and to see Morag again. There were 24 walkers in all, a good turn out again, the other walkers being little Mary (leader), Andrea (back up), Richard (for pointing! ), Jim, Erica, Rosie, Margaret, Ken, Catherine, Irene, Duncan, Audrey, Jimmy, Mary McC, Alison, Carl and Robin. I phoned the Gem Rock Museum to let them know that 22 of us would be with them about 2.30pm. For the first time since the Wigtownshire Ramblers group was formed, members from the Machars outnumbered those from the Rhins – a sign of the growing popularity of this group around Newton Stewart. Twenty four walkers gathered at Adamson Square in Creetown for the start of the walk on a cloudy but dry morning. They seemed to be in high spirits as a spanking pace was set through Creetown and up the hill to Balloch Wood. 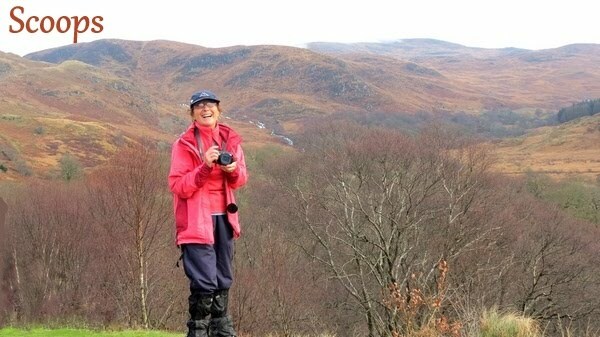 Andrea reminded us of the leadership, map reading and navigation training for next weekend before Mary gave us a short description of today’s walk and introduced the new walkers and we set off through the village, turning off to make our way upwards towards Balloch Wood. After trying to keep up with Mary (or was it a few rogue walkers in front of her?) and gaining red faces and shortness of breath we stopped to replace some oxygen and to let our blood cool at the site of the circle of carved marble with their etched pictures of flowers and butterflies and artistic wording. A pause was taken to read the haikus written by pupils from Creetown School on the polished granite at a Callanish Stones lookalike at the entrance to the wood. Now it became quieter as the group was forced to walk in single file along the path through the trees. Photographers lagged behind as they strove to get choice pictures of the Balloch burn and walkers were intrigued to see the Chalybeate well with its red stain caused by iron rusting in the water. They were also surprised to see that the stage had been cut down probably because it had become slippery and dangerous. The log seating was all that remained and while one member gave an impromptu tap dance show the remainder were enjoined to take a seat and applaud. We were going past the ‘amphitheatre’ – benches made out of halved tree trunks above which had once been an open air stage – when I asked if everyone would take a seat (some stood as the seats were not all sit-upon-able!) so I could get a good photo of the spread out group. Having ‘delighted’ them with my gold medal award tap dancing skills (well, bronze or silver anyway) I received their applause, but not until after I had urged them to give it! Some people can’t recognize talent when they see it! The group eventually emerged from the wood at Cardoon Ponds above the Balloch Bridge where they stopped for sweeties and to admire the metal framed sculpture of the seated man. Some of us left the pathway to view it more closely and I was glad that the planting of climbers which would have covered it had not been successful as it would have spoilt its simplicity and clean lines. I love the way the iron has become a beautiful bronze colour, blending in with its surroundings while still standing out well from above it, from some angles. Catherine bent to test the temperature of the water in the ponds – why, goodness only knows why as there was no way she could be thinking of swimming there today – maybe this was to get an indication of the likelihood of being able to do so in a day or two?!!! Perhaps she will come back with her swimming costume later this week. The walkers now proceeded along the Corse of Slakes road past the Garrochar Christmas tree farm which had famously provided the tree for Number 10 last Christmas. They soon came to a sign pointing over the moor with the information that it was one mile to the top of Larg Hill and two and half back to Creetown. The walkers followed the direction of the signpost upwards through the sometimes muddy track towards the summit. The incline soon had the walkers stretched out with the fittest at the front and the determined bringing up the rear. We had reached the road and followed it uphill until we turned off towards Knockeans Hill. I am obviously getting my energy back as I was able to move upwards, take photos, talk all the time and not get too much out of breath! Slushy snow greeted us near a dyke – some walkers bravely stepped over the slippery fallen stones while the rest of us, having skirted most of the boggy ground near it, went through the open gateway. WE then had to negotiate the dyke! From there I probably talked less, breathed more heavily but took just as many photos as we stopped short of the summit of Knockeans Hill (297m) and experienced slightly increased winds, coming from the south east. Some photos taken, we were quickly on the move, aiming for the top with its distinctive cairn. As we got closer, suddenly Richard fell as his leg was sucked down into a tremendously deep boggy area. It had been covered over by an old iron gate, obviously to discourage going over this area, but his leg went down between its bars and diagonal braising and it took a huge effort for him to extricate his leg which had gone down up to his knee. Fortunately he was uninjured and the accident book was not needed. I would not have fancied being one of the people needed to carry him back down the hill! Actually, really glad you were OK Richard! All eventually reached the summit of Knockeans where they were rewarded with views over Wigtown Bay and Cairnsmore with its cloudy hat. Sheltered spots were now chosen for lunch, although some intrepid members preferred to stay at the summit and have a windblown lunch with a view. The sun came out and the skies turned to blue as the surrounding area gained some clarity. It was hard making a move afterwards as we were quite comfortable sitting on our heather covered bank. Before we moved on I got photos with the whole group in glorious ‘Technicolor’! Lunchboxes packed away, the walkers resumed their ramble, although with some divergence of opinion as to which route to take as the direction posts which had guided them this far were now conspicuous by their absence. Eventually all reassembled at the bottom of Knockeans and began the climb up to the top of Larg. The next high point of Larg Hill (276m – we had to go down to go back up but it was not far) and some of the group seemed to bypass its summit in favour of reaching a good vantage point below us. The views from here from the top and from where they were standing were equally good of the Breakwater that meanders through the Wigtown Sands and of the wonderful snow speckled hills in all directions. I was not the only photographer in the group who thought so – cameras were in use everywhere! The views were even more spectacular from here with the Cree estuary mapped out below and a clear view over to Wigtown and beyond. A steep descent was now made through patches of snow causing some to plunge unexpectedly knee deep into the drifts. The soft snow proved irresistible to some members and snowballs began to be lobbed amongst unsuspecting ramblers. Fun followed once again as we negotiated a deep pocket of slushy deep snow, managing to keep upright and then watching as Ken and Carl came down from a different, more difficult, direction. Snowballs accompanied my attempt at getting through this section – it took all my concentration stepping where others had gone before me and I was pleased not to have the distraction of a direct hit by one of them! Below us Mary and Audrey were trying to clean off their muddy boots in another pocket of snow which turned into a disco dancing session, accompanied by Jim’s incongruous rendering of the ‘Hokey, Cokey’! Walkers were saddened to see the remains of one or two lambs and sheep which had undoubtedly been caught in the recent blizzard and sympathy was felt for the farmers who must still be struggling with the aftermath of the wet summer followed by a cold spring and no new growth to be seen in the fields. However, the group was heartened by the sight of small lambs gambolling about on the lower slopes and the beautiful carpet of purple crocus and yellow daffodils in the church yard which greeted them on their return to the outskirts of Creetown. We reached lower ground and walked beside Castle Cary Wood, encountering a lone lamb on the track, bleating for its mother who was struggling in the distance to extricate herself from an area of deep snow. The sheep was heading in the opposite direction as Jim tried to bring her lamb closer. Thomas was surprised that the sheep had ‘abandoned’ her offspring and wondered if they would re-unite successfully. Certainly the lamb seemed reluctant to see us go. We entered Creetown and passed its impressive church, surrounded by crocus’s and daffodils before reaching our cars, divesting ourselves of muddy footwear and making our way to the Gem Rock Museum where the staff coped brilliantly with the influx of 22 hungry and thirsty walkers. The group now made their way to the Gem Rock museum for a welcome cuppa and tempting cakes. My fruit scone was excellent, thank you Claire. One of the leaders took the opportunity to liaise with the owner, Tim Stevenson, who will be guiding one of the walks during the Newton Stewart Walking Festival which is now only a few weeks away. Andrea and I sought out Tim Stevenson, the curator of the museum, and I arranged to do the recce with him and others at the end of April, before he joins us on the NS walking festival walk which includes a visit to the Devil’s Bridge near Port Logan on Sunday 12 May. 16 people have already booked for this walk and there are only 6 places left on it. Next week will see a change to the usual Saturday walk as members will be treated to a training course on the Saturday night at the Fire station in Stranraer starting at 7pm to be followed by a practical map reading course on Sunday, meeting at New Luce Village Hall at 10am. A good turnout is looked for as the speaker is the official Ramblers instructor and is travelling all the way from Perthshire.